In school we have been studying WWII and the affect of nuclear weapons in general, and specifically in Hiroshima. However, TGS took a new approach and ditched the history text books. The way we learned was through the graphic novel Barefoot Gen. We analyzed the page set up and literary devices while learning about history from a primary source. The panels and onomatopoeia used throughout the novel enhance the story; facts are great for memorization, but a story line says so much more. 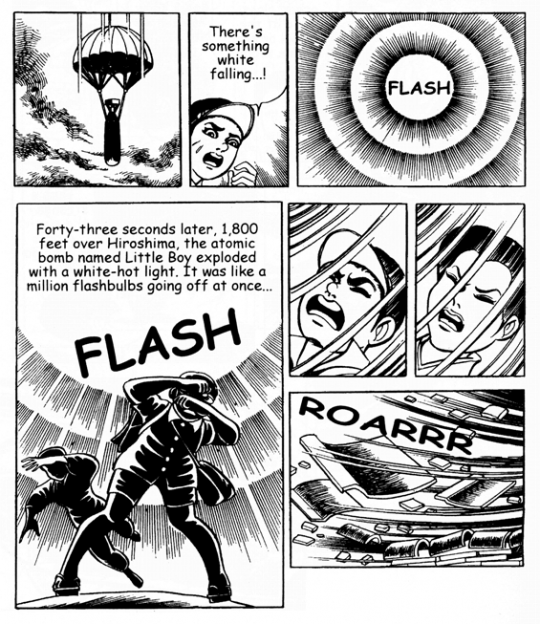 The most important technique I learned from Barefoot Gen was was the power of panels in page setup and being real with the reader. Keiji Nakazawa did not create this for the light hearted in any way, and when we spoke with his wife a few weeks ago she said the same. The more honest and passionate you are about what you write, the more intrigued your audience will be. After reading Barefoot Gen we chose another graphic novel dealing with war and conflict. 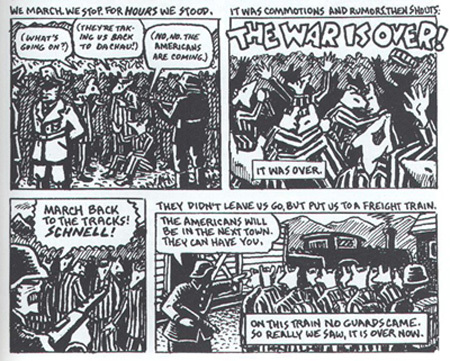 I spoke with some of the older students about this assignment and they mentioned they read Maus while learning about the war in Germany (Spring of 2011). They seemed to be fond of the novel, so during break I picked up the novel. Maus is different from Barefoot Gen in the way it is a story being told, even within the novel. A father who lived during WWII is telling his story to his son and then in the novel the son is asking questions and drawing for the graphic novel in your hands. It is a very interesting concept, and lets the reader connect to the situation rather than simply listening to another story. The use and placement of words stood out to me in Maus. A combination of narrative, speaking, and exclamations are balanced throughout the book. I suppose I noticed this more so than other details because Barefoot Gen is emotional and focuses more on faces and impact on a person specifically. In Maus it was an inverse affect. The novel was not sharing the emotions of one person, but of a people. The Jewish citizens, represented as mice, and the Nazis, represented as cats, were shown in large groups. In Barefoot Gen, close ups on faces is frequent, whereas Maus successfully shows emotions through large groups of people. Barefoot Gen was emotional due to character attachment, Maus was emotional due to the raw honestly that these things actually happened to mass amounts of people. Maus taught me that sometimes broad characters can be just as powerful as main characters. Then is was our turn. Grades 9 and 10 created a graphic novel, but with a slight twist. We learned about human rights and how even though these are natural laws, they are not abided to around the world. We discussed issues and violations, researched, and when we found a topic we connected to, we wrote. Personally, I found the unavailability of education around the world an enormous issue and a violation waiting to be fixed. When I read the stats about education in India, I immediately knew what my topic would be. I remember the CAS projects we did at the Remote Learning Centre and the small children we taught English to. I remembered their little school nestled in a village and I remember how the kids flooded around the bus are we got off, excited to see us and ready to learn through playing games. My graphic novel is an iBook and can be found here. I decided to use the two important aspects I learned from Barefoot Gen and Maus in my novel: honesty and broad audiences. I took a new approach when writing also, so throughout my graphic novel is a narrative poem. I stated what was happening and did not sugarcoat. Also, I wanted the reader to related and feel something as they read, so I have no names for any character. This way it is easier to place yourself in the shoes of any character, or simply look at it from a large perspective and see the characters as general audiences. Below is the author’s note at the end of my novel if you would like to get a taste of it before reading. As a student I realize how much education has allowed me to grow as a person. As a global citizen I realize this right is not available as it needs to be. When I was living in India I did community service at a nearby village with my school and we taught English to young children. Their school is small with maximum fifty students and was kept in mediocre condition. At first I did not question the environment and kept teaching. It was only later that I realized how many kids do not have access to anything like this in the country, and in places all over the world. Millions of children around the world do not have access to education and will never have it available to them. Specifically in India, only 10% of students will continue with and finish schooling. The corruption and unavailability of education all over the world is an issue waiting to be solved, and India is the place to start. I have a connection with this country because of my time spent there, but my decision to focus on India is not only due to an emotional connection. The facts support the cause. India’s literacy rate is at 74% and 4% of children never start school. Those may look like just another percentage, but think about the 1.27 billion people in the country. I believe learning can happen in any environment and we can pick up skills we need to know to survive, but education is different. Education is learning social skills, asking new questions, developing better understanding, it is a pedestal to lift yourself on if you take it the right way. With education, children can grow and see their potential. In a positive learning environment, anything can happen. If we do not allow the generations of tomorrow access to their right to education, we will never reach the brighter future we are hoping for. Tags: education, g10, graphicnovel, hiroshima, india, japan, learning, TGS. Bookmark the permalink.